Following is some information on my one-hour “WordPress 101” at the 2018 Fayetteville WordCamp, June 22-24. 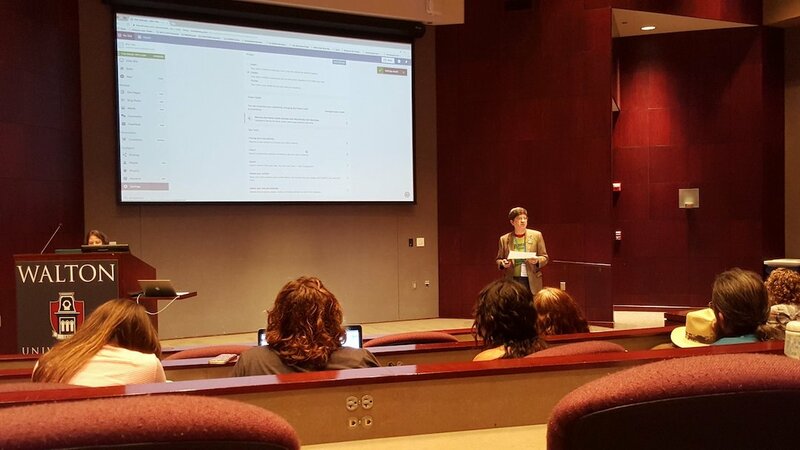 Ben Pollock, at right, steps a volunteer from the audience (at lectern) in creating a WordPress.com website June 23 at the 2018 WordCamp Fayetteville. The session — an introductory beginners class — covers the basics of using WordPress to create blogs and other websites for personal and business projects. This year, I’ll lead a demonstration in WordPress.com and note along the way the similarities to working in WordPress.org to create a site, activate a theme, do basic customization, then publish pages and posts. The slide set (PDF) of this year’s presentation may be of interest. The press release for #wcfay 2018 gives details of the overall weekend, held at the Donald W. Reynolds Center for Enterprise Development at the University of Arkansas. The above was conducted 9-10 a.m. Saturday, June 23. Newcomers to WordPress are told how big it is, but seeing a list of Notable WordPress Users is eye-opening.